Gar Alperovitz’s Green Party Keynote: We Are Laying Groundwork for the “Next Great Revolution” | Democracy Now! delivering the keynote speech at the Green Party’s 2012 National Convention in Baltimore, Maryland. He is a professor of political economy at the University of Maryland and co-founder of the Democracy Collaborative. His most recent book is America Beyond Capitalism: Reclaiming Our Wealth, Our Liberty, and Our Democracy. AMY GOODMAN: We turn now to the 2012 election. The Green Party has officially nominated Massachusetts physician Jill Stein and anti-poverty campaigner Cheri Honkala as its presidential and vice-presidential contenders. Dr. Stein’s ticket easily won with over 190 delegates, compared to 72 for her closest competitor, the comedian Roseanne Barr. Stein and Honkala are running on a platform called a Green New Deal. AMY GOODMAN: …to go to Gar Alperovitz, but I first I want to introduce him. Dr. Stein and Cheri Honkala accepted their nominations on Saturday, and then the keynote address was given by—at the Green Party’s national convention in Baltimore, by Gar Alperovitz. Gar Alperovitz is a professor of political economy at the University of Maryland, co-founder of the Democracy Collaborative, author most recently of America Beyond Capitalism: Reclaiming Our Wealth, Our Liberty, and Our Democracy. GAR ALPEROVITZ: First thing I want to say is I’m from Wisconsin—some Wisconsin people back there. And Wisconsin knows something about third parties. The Republican Party, original Republican Party, was a party to end slavery, started in Ripon, Wisconsin. And indeed the—and it got lost along the way, but it showed one big push on the really important issue of slavery in its early days. Fighting Bob La Follette from Wisconsin, another historical issue that you may remember coming out of that state and starting very small and making a powerful impact. And third, if you look closely at what became the best parts of the New Deal—the labor law legislation, some parts of Social Security, some parts of healthcare and some parts of the other welfare programs—a lot that came up and was was incubated in Wisconsin. Now, I take that—you know, I’m kind of proud to be a Wisconsin guy, but the bottom line there is not about Wisconsin. It is about historical change, how you begin fighting small, and you expand when the time is right, and you make an impact because the other things are failing. That’s what’s happened in many, many cases. Revolutions are as common as grass in world history, and they begin in rooms like this. So, I say that, you know, really as a historian, not as trying to kind of blow smoke in your ear. That’s how it works. That’s how it works. So, when I say I take you all seriously, first, I’m talking to the person in your personal seat. So, when I say I take you seriously, you, more seriously maybe than you take yourself, I mean to say that the beginnings of the next great historic change come from us taking ourselves that seriously. So I urge—and I think many people here do—but I urge that you sit back and say, “Yeah, am I up to that, or am I just doing politics, or am I really up to that?” Now, the “that” is transforming the most powerful corporate capitalist system in the history of the world. That’s what it’s about. And to say that I take you seriously is to say that that is what you’re stepping up to—not simply a gesture, not simply a new party, not simply a green movement. It is that, and that is the challenge. Now, I’m a very cold-eyed realist. I did run House and Senate staffs. I’ve even done stuff, for my pains and for my sins, planning U.N. policy in the State Department, before I left that world many years ago. I’ve been involved in the nitty gritty of ugly politics. I’m no naive guy. And I say to you again that we have the possibility, if we look at the stage we are at and what is happening to the era and who we are existentially—I am talking to the person in your chair—and if we know who we are and take ourselves that seriously, we have that possibility. So, let me go on. The second thing I want to say is, I don’t think that’s always true. But I do think that the emerging era of history into which we are living our lives, the era into which we’re living, may well be the most important period of American history, bar none. Now, I say it as a historian, others would disagree, but I don’t say it lightly. And when I say “bar none,” I mean including the American Revolution and including the '60s and including the Civil War. Whoa, that's a heavy rap, as we used to say in the ’60s. What I mean is that, in many ways, the system is running out of options, and we are beginning to see more and more people aware of the difficulties that cannot be managed the old way. Very briefly, all too briefly, in the 19th century when you ran into problems, you threw land at it, and took more and more land when there was a problem, until you’d taken the whole continent, killing a lot of Indians and others on the way, but managing a system that was a tiny seaboard colony and then took over a continent as it tried to solve problems. And they ran out of land at the end of the 19th century. In this century, not by design, in the first quarter of the century, there was the beginning of a major recession, probably a depression in 1914, and World War II solved the problem in the first quarter of the century. I am not offering a conspiracy theory; that’s just what happened. In the second quarter of the century, it collapsed again, and World War II bailed out the system—not by design. That’s how it worked in the second quarter of the century. And in the third quarter of the century, having defeated the Germans, having defeated the Japanese, and having lost the productive power of many other corporate competitors, plus the Cold War, plus the Korean War, plus the Vietnam War, plus high defense expenditures, that boom third quarter of the century was run that way. We are in a different era. Think about it this way. It is all but impossible to have a massive, industrial-scale war like the First and Second World Wars, land wars, 42 percent of the economy spending on war expenditures. And the reason is, nuclear weapons now make that impossible. It isn’t going happen that way. We my blow ourselves up. But we’re not going to have that massive injection of economic power into the economy to solve the problems. In fact, small—big small wars are also getting less and less powerful. People don’t like them. They don’t like sending their kids. They don’t like spending their money on that. It isn’t just us. And if you look at those expenditures, they are very big. But as a percentage of the economy, they are declining to 3 percent already and going down. A lot of waste there. But you are not solving economic problems that way. I could go into great detail, but I won’t—globalization, etc., competitors, all sorts of problems coming up that are economic. The bottom line is, you can’t solve the problem anymore by throwing land at it, and we’re running out of war, which means lots of problems grow because the political system can’t manage it the way it’s structured, and the opposition that can’t get themselves together to make things happen, and the Republicans stop it, and the Tea Party stop it, and you know all the contradictions. But bottom line is, it can’t solve problems. That’s obvious. Most people know Washington is broken. They haven’t quite realized that the systemic problems are coming to the surface, that it is a systemic crisis. You may get ripples of increased gain and jobs and so forth, but you can’t deal with climate change, you can’t deal with unemployment, you can’t deal with poverty, and we keep getting more and more decay. That’s light bulb time. That’s when people begin asking very serious questions. Now, remember, when I say that, I come at it as a historian. You’ve got to throw a couple decades of your life on the table, not a couple weeks and not a couple elections. But there is growing sentiment on all sides that either we transform this system or profound difficulties, violence, probably repression, possibly something like fascism, if—when the violence begins. There is great danger. But lots of folks sense something’s wrong. It’s the first in my adult life that you find millions of people responding. Listen to the response: Occupy. Occupy was critical, far more important. The American people responded to Occupy. They got it. They know. They know who runs this game. That’s no secret. And it’s a new kind of awareness that something’s going on with those big banks and something’s going on with those corporations—don’t quite know how to get a handle on it. But it is not like if we just elect a Democrat it’s all going to be fine, and the progressive era will start again. There is a sense that’s very deep, and, in my view, given the inability to solve the problems, that’s going to be worse, and the pain is going to increase. And the number of people saying, “There’s got to be a better way. Something different’s got to happen. Somehow we’ve got to start in a different place. Somehow, either we build something new, or this thing is a sham,” that’s a big deal in history. That’s a big deal when people begin asking those kind of questions. Now, it takes a long, painful process, but notice this system probably doesn’t reform in the old liberal way, for all the reasons we know about, including that the labor movement has collapsed from 35 percent to down to 7 percent of the private sector. But probably it doesn’t have a classic revolution, because government is 30 percent of the big floor under the economy. You get decay and stagnation and pain and difficulty. That is a very unusual moment in history, because it goes on and gives time to people to be aware, to build, and to build democratically from the bottom up. If it collapsed tomorrow, the right wing would take over. And if it collapsed to the left, we wouldn’t be prepared. And, above all, we wouldn’t know, from the bottom of our own experience, how to build and run, change, to transform the system. This is an era where things are beginning to open up over time—time for us, including the person standing here and in your seat. Let me put it another way. Third thing I want to say: systems, in history, are defined, above all, by who controls the wealth. No secret. In the feudal era, land was the critical piece. If you had the land and you were the lord, you commanded. In the 19th century, there was a kind of capitalism that was sort of free enterprise. Most of the free enterprise, small business capitalists of the 19th century were actually farmers. They ran a small business called a farm. That was a different, maybe a free time, in some ways, very different time. State socialism was a different way to own capital and run the system. That’s another way to go about it. And we live now in essentially what is called corporate capitalism. And if you look at who owns the system and the power, you all know the income distribution numbers. They’re pretty obvious. It’s gone from about—the top 1 percent has gone from about 10 percent to 22 percent, and then bobbling around, given the recession, in the 20 percent range. Think of that. Gone from 10 percent to 20 percent in 30 years. Who lost that money? But wealth is even worse. The way you define a system is who owns the capital and who owns the wealth, and 1 percent owns just about half of all the investment business capital—1 percent. Five percent own 70 percent. And the top—this is the number you’ve got to get your head around, really odd, and I checked it many times. Think about this, the top 400 people—not percent, people, 400—own more wealth now than the bottom 185 million Americans taken together. That is a medieval structure. I don’t mean that rhetorically. I don’t mean that rhetorically. I mean that technically. That’s the way you concentrated wealth in the medieval era, really. So, the question becomes—and here’s the third thing I think a lot about we do a lot with—is there any sign, if you don’t like state socialism, you don’t like corporate capitalism, that we can build a democratic system from the bottom up that also changes the ownership of capital and is also inherently green? How do we do that? We. We. One of the things that’s happening—and this is exciting stuff going on that the press simply does not cover. They don’t have any interest. If they had any interest, they’d be looking the other way, because they would—but they don’t have any money to do it. The press is being stripped of all capacity to report. But on the ground, there are now, what, 10 million people involved in worker-owned companies. Did you know that? Ten million. There are—in America. A hundred and thirty million are involved in co-ops and co-op credit unions—40 percent of the society. Four or five thousand neighborhood-owned corporations, thousands of social enterprises. Odd bits and pieces here and there, like Sarah Palin’s Alaska. They use the oil revenues as a matter of legal right. Everybody gets a piece. Where did that come from? It’s a maverick country, but there it is. They don’t do that in Texas. We’re going to do that a lot elsewhere, when we get to where we’re going to get. If you look carefully on the ground, there are these social enterprises popping up, credit unions, etc., etc., and there are many, many, many more experiments. Something like 20 states are now—have legislation before them, like the Bank of North Dakota, a state-owned bank. And many other states, another 20 approximately, are considering single payer. And here is the issue. As the pain deepens—that’s why the era is critical. As the pain deepens, and we have time to build, and we work to build, more and more people begin to see, you’ve got to come up with a new answer. My judgment is—and I think I’m not blowing smoke—those kinds of experiments are the only way to build the popular base with the politics and the projects, with the politics and the projects. There’s a really beautiful thing going on in Ohio, in Cleveland, that we’ve been involved with. I was involved with the Youngstown workers in 1977, when the first big steel closing occurred, and the workers tried to take over. And they got clobbered. But they organized their politics and got a lot of people involved. So, in Ohio, the idea of worker ownership is a bigger idea. Lots of people understand it. And in Cleveland, building on the Mondragon model—some of you know about the Mondragon model—and other ideas, there are a series of worker-owned, integrated co-ops in Cleveland in a neighborhood where the average income is $18,000 per family. And they have got these co-ops, not just standing alone, but linked together with a nonprofit corporation and a revolving fund. The idea is to build the community and worker ownership, not just make a couple workers richer, to say the least, not rich, but to build a whole community, and to use the purchasing power of hospitals and universities—tax money in there—Medicare, Medicaid, education money, buy from these guys, and build the community. That model—and it’s the greenest for—one of the things is the greenest laundry in that part of the country, that uses about a third of the heat and about a third of the electricity and about a third of the water. They’re on track now to put in more solar capacity that exists—one of the other worker-owned companies—that exists in the entire state of Ohio. These are not little, dinky co-ops. There’s another one they’re just about to open, which is a greenhouse, 3.25 acres. The greenhouse hydroponic will be the largest in the United States in an urban area, the largest in a worker co-op, worker-owned, in a community-building structure, capable of producing something like five million heads of lettuce a year. That’s happening. You can do that, and you could force the politicians to help you do that. They’re pointing out, I’m getting limited time, so I’m going to go quickly. All I want to say there is there’s a website, community-wealth.org — put the dash in — and you will find thousands of things that are happening on the ground that change the ownership of wealth and begin to green the economy. And it is part of the new deal that we’re going to build forward as we go on through the decay. That’s the direction. But let me say a few—given the time available, just a couple of other things. Those are the kind of things that are the prehistory of the next great revolution. That’s how you build it. You generate the ideas, and then you begin to protect national ideas out of real experience and out of real commitment. So, did you happen to notice, we did nationalize two big auto companies when the crisis came, and we pretty much nationalized the banks before we gave them back. So, when those crises come—and they will come—if we’re prepared with a highly democratic vision and if we know something and if we build the politics—I’m not just talking about communities. That’s critical. If you don’t have democratic experience in local communities, you’ve got nothing. But the ideas, like Wisconsin, pointing to the New Deal, those ideas also generate vision for the long, larger scale when time goes on and we build forward. So, now, that’s also a heavy rap. I am saying that we are laying the foundations, bit by bit, in an extremely unusual period of history, the most important moment in history, because they’re running out of options, in my view. And mine is suggesting we can take it forward in a positive way. He says I got one minute left, so let me tell you. I want to say something far more radical than I’ve said before. This is the most radical thing you’re going to hear: I think there is hope. Hope, I mean, is—I’m no utopian. I don’t mean it’s going to be hard and tough, and a lot of stuff is going to go wrong, and a lot of pain and a lot of difficulty. But I don’t think they’ve got all the answers, and I don’t think they’ve got all the power, and I don’t think they can solve it. And I do believe—person in your chair, why I take you seriously. Can you wrap your heads around, really—I mean, really—that we are in position to lay down the foundations for the next great transformation—really, not just doing token politics, not just building the party—all that is critical—not just laying the foundations, but really laying the groundwork for transformation to a highly democratic new system beyond the old traditions, one that is sustainable, one that deals with climate change, but also alters the ownership and democratizes wealth? That’s our question. One last thing, because she’s waving me down, and I’m trying to be good about this. I give you just a little fragment more of the book, because this is—two fragments, actually. This is a really interesting one. They’ve been polling younger people—not people my age and grey, greying and so forth, but, you know, people in the range of 18 to 29. These are people who really will build the next politics. A lot of them are in this room. Now, it turns out that in the latest polls—turns out that when you look at it, about 45 percent, 43 percent have a positive reaction to the word “capitalism,” and 49 percent have a positive reaction to the word “socialism.” I don’t know that any of those folks actually know what the word “socialism” means or what the reaction, but the idea that they understand something different really has got to happen is embedded in those politics. But one last one I just—I saw it just the other day. I did a piece for Sojourners magazine, one of the real radical activist group of religious Christians. And one of the poll data, a piece of poll data I saw was this. It said 36 percent of all Americans polled—one of the big polling agencies, not a side one, not a biased one—36 percent decided and were quite sure that capitalism—Christianity and capitalism could not be reconciled. So, my urging—I am pleased to be here, but I don’t think anybody moves the ball like people in this room when they get serious. So I urge you to, you know, remember this Wisconsin kid who has all this weird history of Gaylord Nelson and all these parties that actually did something and all these precedents that actually built and laid foundations. My suggestion to you is that we together are in fact capable, if we rise to that level of existential self-awareness—real hard, real hard. People want to do projects. They want to do politics. They don’t want to get as serious as it takes to really transform the system. So, that, I think, is our challenge, and I see a lot of people in this room really up and ready to do it. Thank you for having me. 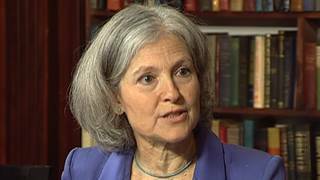 AMY GOODMAN: That was Gar Alperovitz delivering the keynote speech at the Green Party’s 2012 national convention in Baltimore, Maryland, where the party nominated Massachusetts physician Jill Stein and anti-poverty campaigner Cheri Honkala as its presidential and vice-presidential candidates. Visit democracynow.org for our interviews with Stein and Honkala. Gar Alperovitz is professor of political economy at the University of Maryland. His latest book, America Beyond Capitalism: Reclaiming Our Wealth, Our Liberty, and Our Democracy. And in the coming days, we’ll look at the largest worker cooperative in the world, Mondragon in Spain, where Democracy Now! broadcast earlier this month. Tune in Tuesday for our interview with Chris Hayes, host of the MSNBC show Up with Chris and author of the new book Twilight of the Elites: America After Meritocracy. You can email your suggested questions or comments to stories(at)democracynow.org, or post them on Facebook or Twitter.